An author has always great difficulty in avoiding unnecessary and tedious detail on the one hand; while, on the other, he must notice such a number of facts as may convince a student, that he is not wandering in a wilderness of crude hypotheses or unsupported assumptions. In A Geological Manual (1832), Preface, iii. And so many think incorrectly that everything was created by the Creator in the beginning as it is seen, that not only the mountains, valleys, and waters, but also various types of minerals occurred together with the rest of the world, and therefore it is said that it is unnecessary to investigate the reasons why they differ in their internal properties and their locations. Such considerations are very dangerous for the growth of all the sciences, and hence for natural knowledge of the Earth, particularly the art of mining, though it is very easy for those clever people to be philosophers, having learnt by heart the three words 'God so created' and to give them in reply in place of all reasons. About the Layers of the Earth and other Works on Geology (1757), trans. A. P. Lapov (1949), 55. Art is usually considered to be not of the highest quality if the desired object is exhibited in the midst of unnecessary lumber. In Mathematics: Queen and Servant of Sciences (1938), 20. Bell is writing about the postulational method and the art of pruning a set of postulates to bare essentials without internal duplication. At first sight nothing seems more obvious than that everything has a beginning and an end, and that everything can be subdivided into smaller parts. Nevertheless, for entirely speculative reasons the philosophers of Antiquity, especially the Stoics, concluded this concept to be quite unnecessary. The prodigious development of physics has now reached the same conclusion as those philosophers, Empedocles and Democritus in particular, who lived around 500 B.C. and for whom even ancient man had a lively admiration. 'Development of the Theory of Electrolytic Dissociation', Nobel Lecture, 11 December 1903. In Nobel Lectures: Chemistry 1901-1921 (1966), 45. Marx and Science (1952), 39. By relieving the brain of all unnecessary work, a good notation sets it free to concentrate on more advanced problems, and in effect increases the mental power of the race. In An Introduction to Mathematics (1911), 59. Educators may bring upon themselves unnecessary travail by taking a tactless and unjustifiable position about the relation between scientific and religious narratives. … The point is that profound but contradictory ideas may exist side by side, if they are constructed from different materials and methods and have different purposes. Each tells us something important about where we stand in the universe, and it is foolish to insist that they must despise each other. In The End of Education: Redefining the Value of School (1995), 107. As quoted by Charles Hutton in A Philosophical and Mathematical Dictionary (1815), Vol. 1, 708. 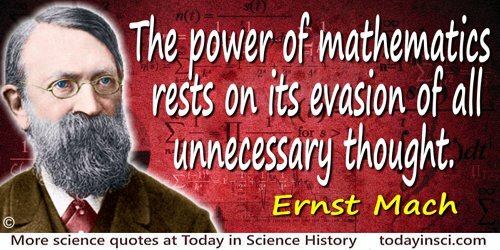 Strange as it may sound, the power of mathematics rests on its evasion of all unnecessary thought and on its wonderful saving of mental operations. As quoted, without source, in E.T. Bell, Men of Mathematics (1937), Vol. 1, l (Roman numeral 'l'). The only object of theoretical physics is to calculate results that can be compared with experiment... it is quite unnecessary that any satisfactory description of the whole course of the phenomena should be given. The Principles of Quantum Mechanics (1930), 7. The only objections that have occurred to me are, 1st that you have loaded yourself with an unnecessary difficulty in adopting Natura non facit saltum so unreservedly. … And 2nd, it is not clear to me why, if continual physical conditions are of so little moment as you suppose, variation should occur at all. However, I must read the book two or three times more before I presume to begin picking holes. Letter to Charles Darwin (23 Nov 1859). In Charles Darwin and Francis Darwin (ed. ), Charles Darwin: His Life Told in an Autobiographical Chapter, and in a Selected Series of His Published Letters (1892), 214. The primary aim, object, and purpose of consciousness is control. Consciousness in a mere automaton is a useless and unnecessary epiphenomenon. An Introduction to Comparative Psychology (1894), 182. Those who have occasion to enter into the depths of what is oddly, if generously, called the literature of a scientific subject, alone know the difficulty of emerging with an unsoured disposition. The multitudinous facts presented by each corner of Nature form in large part the scientific man's burden to-day, and restrict him more and more, willy-nilly, to a narrower and narrower specialism. But that is not the whole of his burden. Much that he is forced to read consists of records of defective experiments, confused statement of results, wearisome description of detail, and unnecessarily protracted discussion of unnecessary hypotheses. The publication of such matter is a serious injury to the man of science; it absorbs the scanty funds of his libraries, and steals away his poor hours of leisure. 'Physiology, including Experimental Pathology and Experimental Physiology', Reports of the British Association for the Advancement of Science, 1899, 891-2. Unnecessary noise is the most cruel absence of care which can be inflicted either on sick or well. In Notes on Nursing: What it is, and What it is Not (1860), 47. In The Elements of Style (1918). What is called science today consists of a haphazard heap of information, united by nothing, often utterly unnecessary, and not only failing to present one unquestionable truth, but as often as not containing the grossest errors, today put forward as truths, and tomorrow overthrown. In Leo Tolstoy and Charles R. Joy (ed. ), Lyof Tolstoy: An Anthology (1958), 34. When a community or species has no known worth or other economic value to humanity, it is as dishonest and unwise to trump up weak resource values for it as it is unnecessary to abandon the effort to conserve it. When it was first proposed to establish laboratories at Cambridge, Todhunter, the mathematician, objected that it was unnecessary for students to see experiments performed, since the results could be vouched for by their teachers, all of them of the highest character, and many of them clergymen of the Church of England. In The Scientific Outlook (1931, 2009), 49. When you wish to instruct, be brief; that men's minds take in quickly what you say, learn its lesson, and retain it faithfully. Every word that is unnecessary only pours over the side of a brimming mind. In Norbert Guterman, The Anchor Book of Latin Quotations (1990), 193.